The APWG holds a General Meeting each year in the fall. 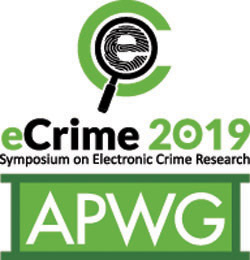 This is held in conjunction with the eCrime Researchers Symposium, our academic peer reviewed research event with published proceedings with our Supporting Sponsor IEEE-SA. Additionally we host our eCrime Operations Summit toward the Fall of each year and several smaller "Sync-Up" meetings throughout the year. Please see the menu on the left for current scheduled meetings.